Can you believe it’s almost the holidays? They say time passes quickly as you get older and have kids, but I never really believed it until it was my reality—time seriously flies. Before we know it, it will be January 1st and we will be setting our New Year’s Resolutions. The holidays should be a time of joy, but I know many people (myself included sometimes) can get overwhelmed by the stress holidays bring—the travel, commitments, and simply being out of your normal routine. For others who are trying to eat healthy, lose weight, or maintain their prior weight loss, there’s an added dose of stress (holiday parties = alcohol, desserts, etc.). Unfortunately, the holiday season is so busy, it’s easy to lose sight of your health and fitness goals and just say to yourself, “I’ll just start over on January first” But, why wait? Why do we wait until the New Year to start being healthy?! In the world of health and fitness coaches, historically January is busy, busy, busy. My inbox will be full of messages asking me about fitness and nutrition programs… a New Year’s Resolution. But for some reason, right now (the holiday season) often is our slowest time of the year. Personally, I feel the most motivated this time of the year because I want to finish the year strong. I don't want to feel like I'm starting at square one come January 1st! At the same time though, I also want to enjoy the holidays! Heck yes, I let myself indulge a bit, but I also still try to eat healthy 80% of the time and I still try to fit in a 30-minute workout 5-6 days each week. I start to think about how I will feel at holiday parties and other events if I do not take care of myself. (Don’t you want to feel amazing at all of those gatherings?!) 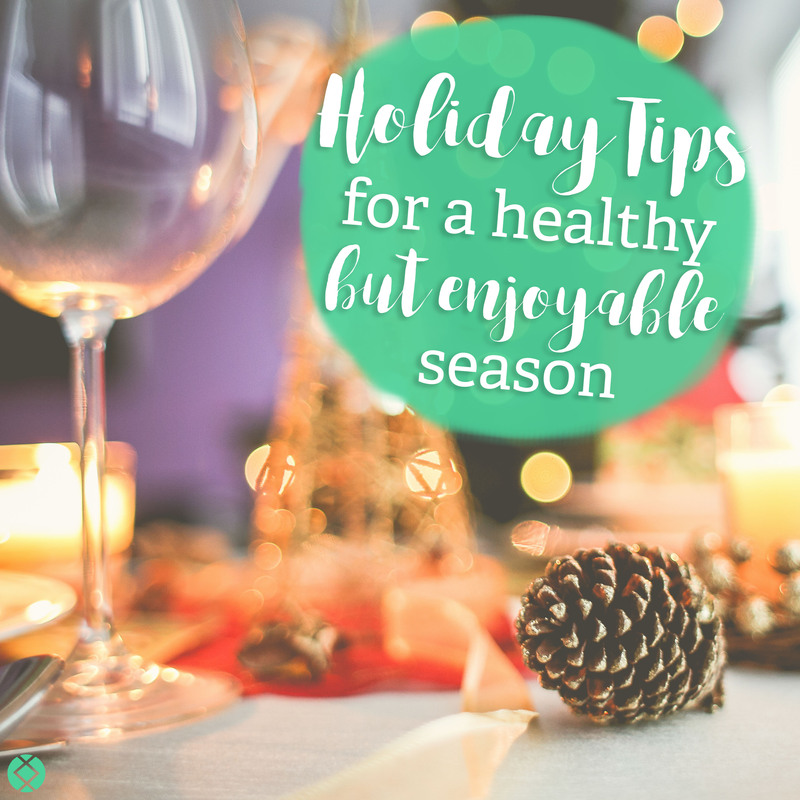 I know that others struggle with the same temptations and treats and I do, so I want to share with you my top tips for beating the holiday weight gain! And allow yourself to enjoy those (in small portions). Everything in moderation! I truly believe that life is about living by the 80/20 rule. What’s the 80/20 rule, you ask? Eat well 80% of the time and that 20% will not derail you from your health and fitness goals. 2. Never go to a party hungry. Have a pre-party snack that is healthy and filling such as a piece of fruit or fresh veggies. Commit to 5-7 servings of fresh fruits and veggies daily. These are lower in calories, filling, and will help you stay on track when you are presented with desserts and holiday treats! It does not have to be strenuous or anything crazy, but just get moving. Take a yoga class, go for a walk with a friend, go for a hike, take your dog for a run… do whatever you like to do! Remember, for your heart health, 30 minutes a day of exercise is what is recommended. Choose a small plate (smaller plates make you feel like you’re getting more food) and watch your portions. Choose just one treat (maybe 2 if they’re small) and go heavy on the fresh fruits and vegetables. 5. Don’t waste all of your calories on drinks. Limit alcohol intake and be cautious which you choose. Wine or a light beer tend to have fewer calories than some of the holiday favorites (eggnog, for example). I’d recommend no more than 1-2 drinks in a given day, calories can add up quickly when it comes to drinks. And avoid soda (here's why), instead choose a flavored sparkling water with no added sugars, sweeteners, or sodium. 6. Offer to bring a dish to the party. Bring a dish to share to the party and make it a healthy and delicious version. By doing this, you can guarantee you’ll have at least one dish you’ll have at least one guilt-free dish that you’ll enjoy! 7. Treat yourself to a holiday fitness gift. Maybe it’s a new workout top, leggings, or shoes or maybe it’s earbuds so you can listen to music while you walk or run! These gifts will help re-motivate you to use them and stay focused during this time of year that is filled with temptations. 8. Remember to maintain a normal sleep routine. Avoid screen time just before bed. Instead, spend time with your family or read a good book. Turn down the brightness on your phone or turn on Night Shift. If you have an iPhone you have the option to turn on “Night Shift.” This option will gradually make your screen color warmer as the sun sets to eliminate the blue light (known to keep you awake and stimulated). If you don’t have an iPhone, try turning the brightness down instead. Avoid stimulants late in the day such as coffee or energy drinks. These can disrupt your circadian rhythm or natural sleep/wake cycle. No, not alcohol! Make sure you’re hydrating daily with plenty of water. Did you know that the recommendation for daily water intake is ½ your body weight in ounces. (Ex: a 150-pound woman should drink at least 75 ounces per day). Want to spruce it up? Try sparkling water or regular water with fresh lemon, cucumber, or berries! Giving back to others and spending time with those you love. Instead of focusing on food this time of year, focus on the people you get to spend time with you. Your family, your friends, co-workers, kids, everyone around you! Grab tea or coffee with a friend haven’t seen in awhile or watch a favorite holiday favorite with your kiddos and make a bowl of air-popped popcorn! Try planning a holiday date night with your significant other or volunteering at your local food bank with the whole family. Just find something that will fill your soul with happiness and joy. 1. Wake up first thing in the morning & have a tall glass of warm lemon water. There are a lot of benefits to drinking a glass of warm lemon water first thing in the morning. It helps aid in digestion by flushing out unwanted materials and toxins from your body, cleanses your system by increasing the rate of urination and helps detoxify the body. It also boosts your immune system and balances pH levels by keeping the body alkaline. Lemon water energizes you and enhances your mood, promotes healing, freshens your breath, and hydrates you! Making Lemon Water: Use purified lukewarm water and add fresh organic lemon to your water. Drink this first thing in the morning before you eat breakfast, exercise, or get ready for the day. 2. Eat a light breakfast. Overnight Oats: Use a small mason jar & mix 1/2 cup dry oats, 3/4 cup water, 1 tsp natural peanut butter, 1 tsp vanilla extract, and dash of cinnamon together. Next, add 1/2 cup fresh berries of your choice on top (or chopped apple or banana pieces) and refrigerate overnight, you can either eat it cold or reheat it! 3. Schedule a morning workout. There’s no better way to burn off a few of those extra calories than with a good sweat. Try to get in a cardio workout or resistance training with weights (or even just your body weight). Shoot for a 30-minute workout. Be sure to hydrate. Again, remember to aim for 1/2 your body weight in ounces of water daily. If you what you need is accountability (and don’t we all just a little? ), consider joining one of my upcoming accountability groups! Fill out the form below and I’ll get you more info about joining!